As a 39-year old taking over as head coach for the first time, Ryan Day can't be blamed for surrounding himself with experience. Though the staff he inherited from Urban Meyer already features a pair of experienced and respected staff members in offensive coordinator Kevin Wilson and associate head coach/defensive line wizard Larry Johnson, half of Day's assistants have been coaching at the FBS level for less than a decade. With the hire of veteran defensive coordinator Greg Mattison, though, Day has a seasoned leader taking over a unit in dire need of a revival. The regression of Ohio State's defense under the previous coordinator, Greg Schiano, was well documented. But with 18 seasons as a coordinator under his belt, including three with Urban Meyer at the Universty of Florida and two more with the Baltimore Ravens, Mattison brings a wealth of knowledge that should help Day sleep at night. Just as he did in his most recent coordinator gig, when he led the Michigan defense under Brady Hoke from 2011-2014, Mattison will be tasked with shoring up an inconsistent unit prone to big giving up big plays. In only one year on campus, the veteran coach led the Wolverine defense from the 110th ranked unit in total defense all the way up to 17th without a major turnaround in personnel. USE GREAT FUNDAMENTALS/ TECHNIQUE- TACKLE, BEAT BLOCKS! PRESSURE THE OFFENSE (CALCULATED, NOT RECKLESS) MAKE THEM REACT TO US! COMMUNICATION- WE MUST ALL BE ON THE SAME PAGE! DEFEND FORMATIONS- STOP WHAT THEY DO BEST! DEFEND BEST PLAYERS- SCHEME TO MINIMIZE EFFECT OF BEST WEAPONS! EFFICIENT PREPARATION- ATTENTION TO DETAIL- WORK SMARTER THAN OUR OPPONENT! This focus on the basics wasn't just on paper, as those covering his team noticed the change right away. As WolverinesWire publisher Isaiah Hole told Eleven Warriors last week, "where he really shined – and what Michigan really needed at the time – was a reboot in fundamentals. What he inherited was a group of players that were certainly talented (look at current NFL players such as Jake Ryan or Frank Clark) but were either put in bad positions or didn’t have the technique necessary to compete at a high level. Mattison changed that nearly overnight." When it comes to his schemes, Mattison espouses the philosophy laid out by Day in his introductory press conference as head coach, with the ability to be aggressive and multiple in alignment, but in a way that doesn't overwhelm the players. 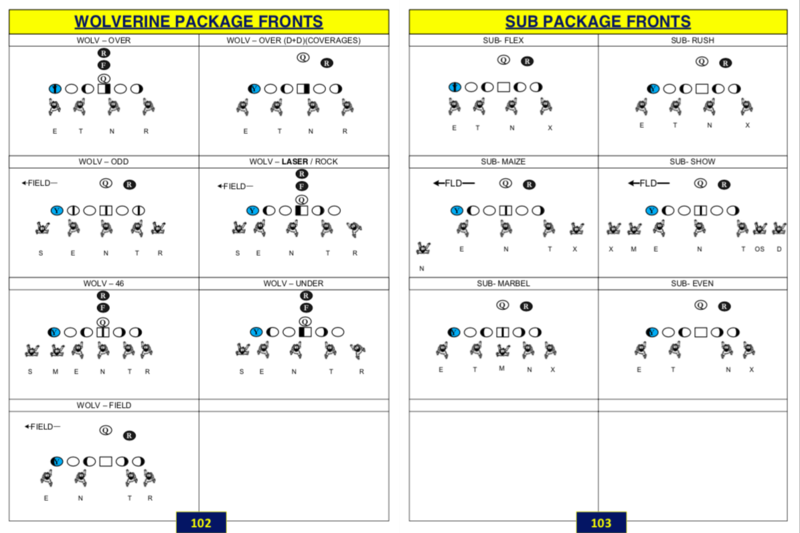 After leading the Ravens' 3-4 scheme following years of leading traditional 4-3 Under systems that were common in the 1990s and 2000s, Mattison's Michigan defenses featured a variety of fronts, often mixing even and odd looks from one play to the next. The most unique piece of his fronts was the use of what he called a "Rush LB" instead of a typical weak-side defensive end. Though this player was often the best pass rusher on the roster, Mattison would occasionally drop him into coverage and replace his pressure with a blitzing linebacker or defensive back. Should the new coordinator decide to keep this piece of his system in Columbus, Chase Young appears the most likely candidate to fill the role thanks to his athleticism. Behind that front, Mattison and linebackers coach Al Washington will have a veteran, though often maligned, crew to help turn around. But the starting trio of Pete Werner, Tuf Borland, and Malik Harrison will surely hear their coordinator's "Golden Rule of Linebacker Play" quite often: Trust your keys and trust your gaps! We play team defense and everyone must do their job. The ability to play between 65 and 70 snaps, never forecasting the future or judging the past, will determine just how good a defender you will become. Don’t worry about the Product, just focus on the Process. The margin for error at Linebacker is a minute. That’s why it will be vital to master the fundamentals and techniques required to play the Linebacker technique. We will develop a work ethic second to none. Our preparation both in the classroom and on the practice field will give us the best possible chance to go out and compete at the highest level. Make no mistake about it, we will be the most Physically and Mentally prepared Linebacker in the Big 10 Conference. The final piece of the puzzle is the coverage behind those front seven defenders. Though Day has made it clear that co-coordinator Jeff Hafley will help oversee this aspect of the unit, mirroring the split duties given to Day and Wilson on the offensive side following their hiring in 2016, Mattison's duties as primary play-caller lead me to believe he'll still play a major part here. With that in mind, Buckeye fans should welcome the fact that the veteran coach doesn't lean on one coverage over others, with a trio of styles appearing consistently throughout his playbook. However, the first thing Jordan Fuller, Damon Arnette, Jeffrey Okudah, and Brendon White should expect to learn is Mattison's quarter-quarter-half pattern-match coverage, which he calls Cover 6. The coverage essentially splits the field in half, with the wide-side defenders playing traditional Quarters pattern-match coverage, like the Buckeyes primarily ran under Chris Ash, while the boundary defenders play the pattern-match version of Cover 2. Like Gary Patterson's TCU system, the secondary defenders essentially play two coverages at once, adjusting their side as needed. The biggest change for Buckeye corners, however, is their responsibility against the run. In Schiano's system, corners were asked to trail receivers in man-coverage on virtually every snap, rarely keeping eyes on the backfield. Now, when acting as the boundary corner in Cover 6, though, they'll play a squat technique in which they jam the receiver initially off the line before acting as the contain defender tasked with setting the edge and turning runners back inside. Against the pass, they'll look for the #2 receiver releasing from the middle, identify any shallow crossers, or sit in the flats and read the quarterback's eyes (as seen below). The change-up to this coverage is Mattison's Sky adjustment. While the defenders to the field continue to play Quarters, the boundary cornerback and safety swap roles from traditional Cover 6. In 6 Sky, which is a form of Robber coverage, the corner is responsible for playing the deep half, which often means shadowing the lone receiver to that side with soft coverage, playing what Mattison calls a Tight 1/2 technique. The safety, however, now can play closer to the line, mimicking an extra linebacker capable of stopping the run. Though he's technically responsible for covering the #2 receiver vertically, the safety is the contain player to the boundary. Against option teams that heavily involve the quarterback in the run game, such as Ohio State when Braxton Miller and J.T. Barrett were at the helm, this tweak allowed the safety to act as the robber, reading and reacting to whatever was in front of him. On third and fourth downs, however, Mattison likes to mix up both his pressures and his coverages to create confusion. When sending blitzes, Mattison isn't afraid to line up in man-coverage behind it but prefers to run the pattern-match version of Cover 3. Made famous by Nick Saban at Alabama, this coverage often appears to be simple, man-coverage with a deep safety in the middle of the field (like Greg Schiano relied upon during his time in Columbus), since when every receiver releases vertically downfield, that's exactly what the coverage becomes. 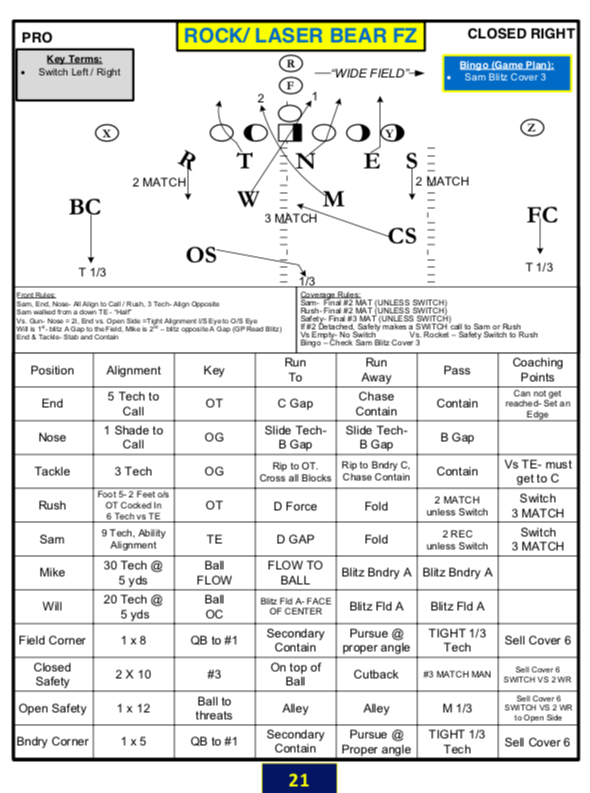 When receivers begin crossing, however, the "match" aspect of this zone defense comes into play. While defenders cover receivers with man-to-man technique, they're all responsible for specified zones. 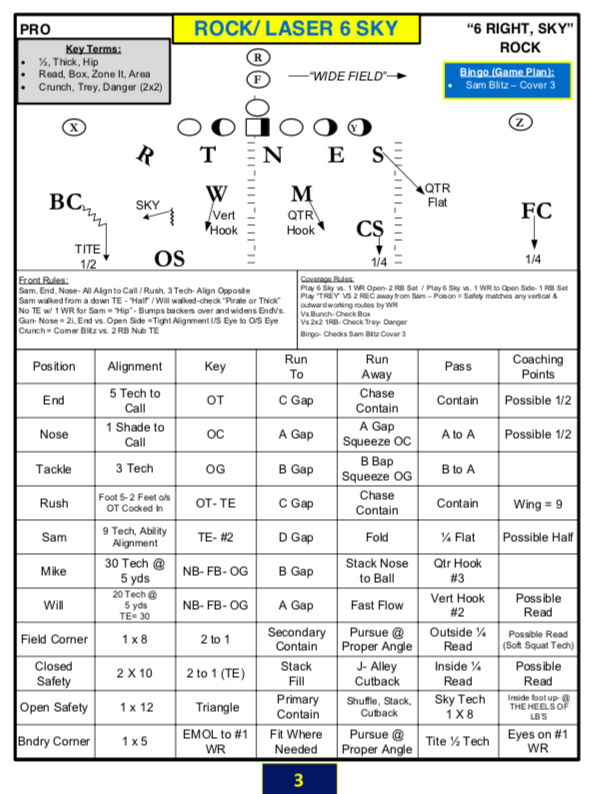 Unlike Saban's version, which starts with two deep safeties and rotates the responsibility of which plays the deep middle zone based on the offensive formation (called Rip/Liz), the open (boundary) safety in Mattison's defense is almost always playing centerfield. In front of him, though, Mattison will play with the responsibilities of the underneath defenders, sometimes including the rush end in coverage while bringing pressure elsewhere. Hafley is quite familiar with this Match 3 coverage, as the 49ers relied on it heavily this past season. Though Mattison rarely called it without sending pressure during his most recent stint as Michigan's DC, it's possible we see it called more often in Columbus given Hafley's familiarity. Additionally, it's a strong possibility that Mattison borrows a number of concepts from his most recent boss, Don Brown. Though Brown's tendencies were exposed in this year's iteration of The Game, his schemes and approach to defending spread offenses are among the best in the sport. No one would blame Mattison for borrowing a page or two from Brown's playbook. 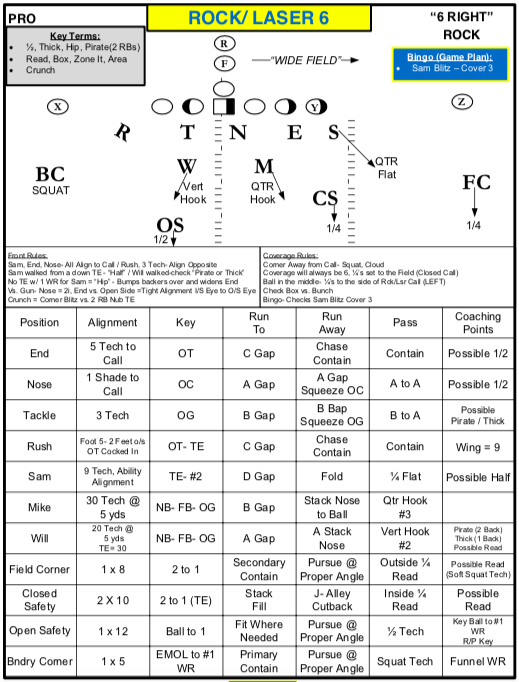 However, the calling card of Mattison's units are not his schemes, but his fundamental approach to playing team defense. His defenses may not always be the most exotic, but his players always know where to line up and how to communicate, shed blocks, and make tackles. Over the past few years, the individual failure of a single player in Schiano's man-coverage system sunk the unit entirely on far too many occasions. Though the Buckeyes have moved from a defensive staff with four former play-callers to just one, Mattison's focused philosophy which asks the unit to play as a whole should be welcomed with open arms. Not only is responsibility shared in his system, but this team-first attitude is also embraced. There are over 300 pages in Mattison's 2013 playbook, but the most informative may the first one behind the table of contents, which features only a passage from Rudyard Kipling's Law of the Jungle.